Eggplant dishes are very popular in Georgia and there are many variations. 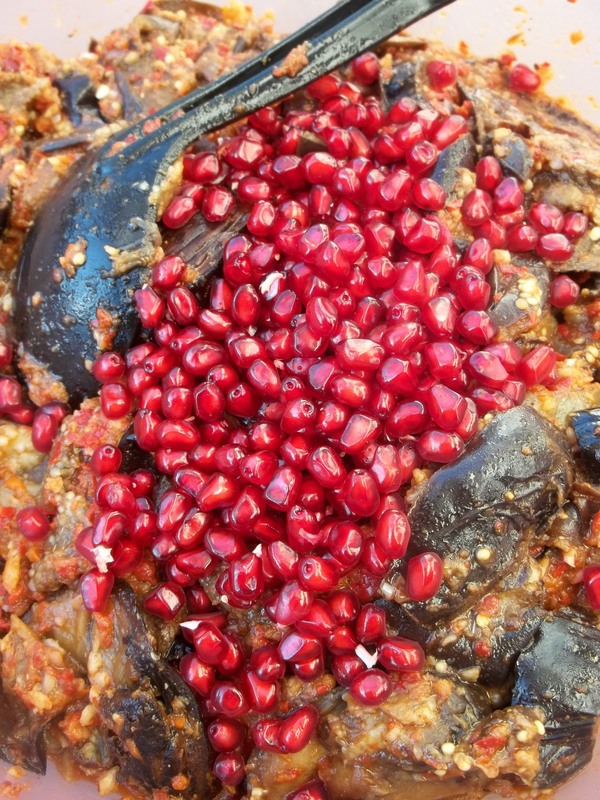 In this recipe we show how to make a popular family dish made with fried eggplant, garlic, pomegranate seeds, and sweet and hot red peppers. 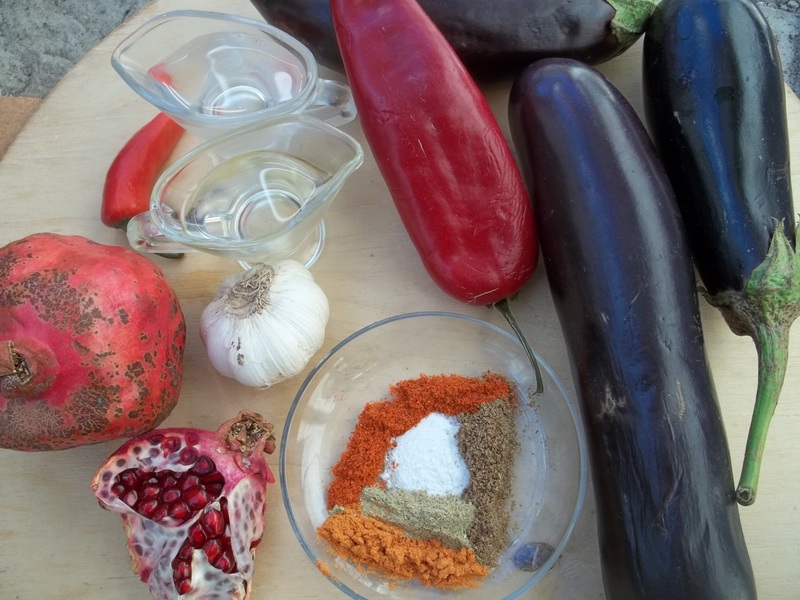 Ingredients: 3 kilos of eggplant, 120 grams of garlic, 2 pomegranates, 700 grams of sweet red pepper, 300 grams hot red pepper, 700 ml of oil, 200 ml of white wine vinegar, 2 heaped tbs of dried marigold, 2 level tbs of dried coriander, 2 level tbs of blue fenugreek, dried hot red pepper (amount dependent upon personal preference – can be omitted), ground black pepper (amount dependent upon personal preference – can be omitted), and salt (amount dependent upon personal preference). Note: The ingredient picture below contains all of the ingredients but does not show the full quantity of some of them. 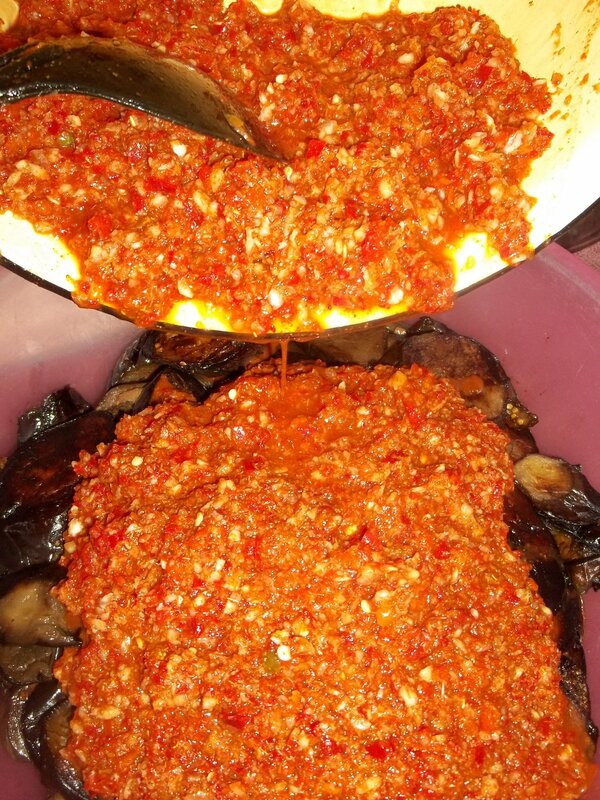 Preparation: Slice the eggplants and add to a pan with oil. 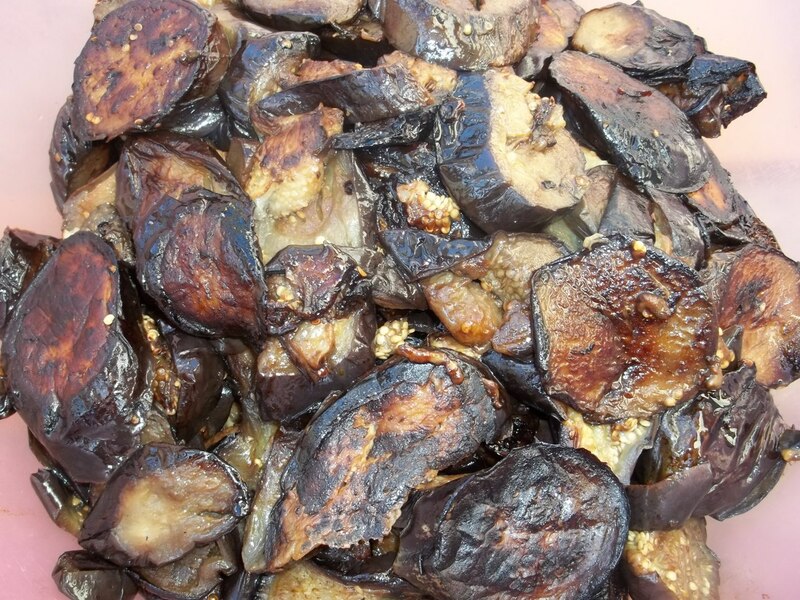 Unless you have a very large pan you will need to divide the sliced eggplants and fry in batches. 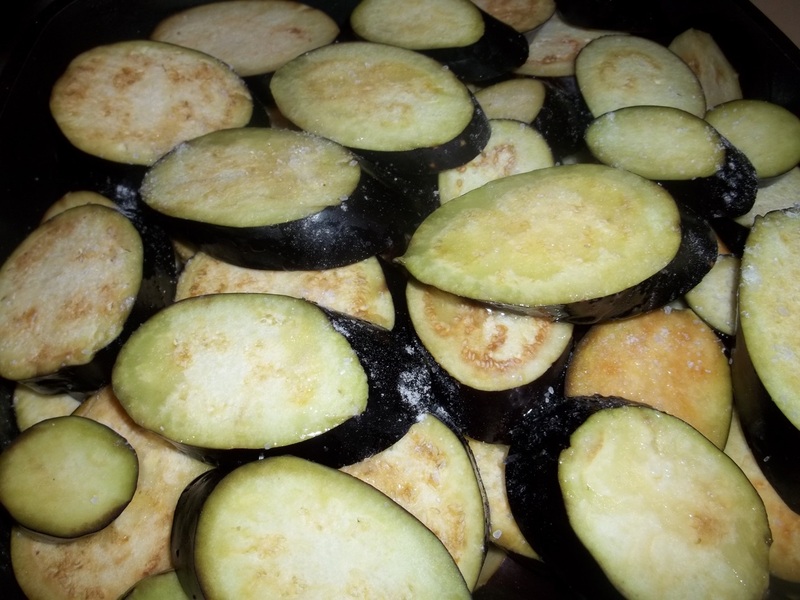 Sprinkle the sliced eggplants with salt and fry (covered) on a medium heat until one side is fried. Remove cover and fry the other side. Repeat the process until all of the eggplants are fried. Once the eggplant has been fried, put it in a mixing bowl and allow to cool. 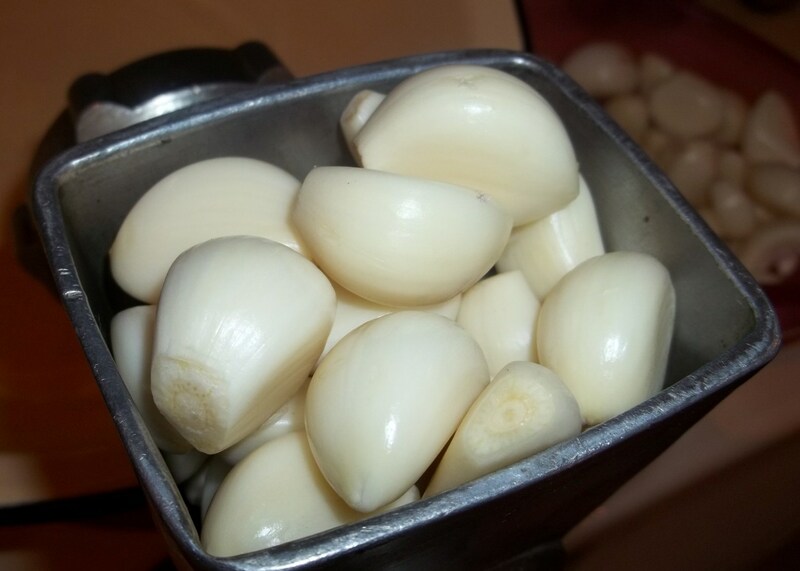 Crush the garlic (we used a meat grinder) and add to a mixing bowl. 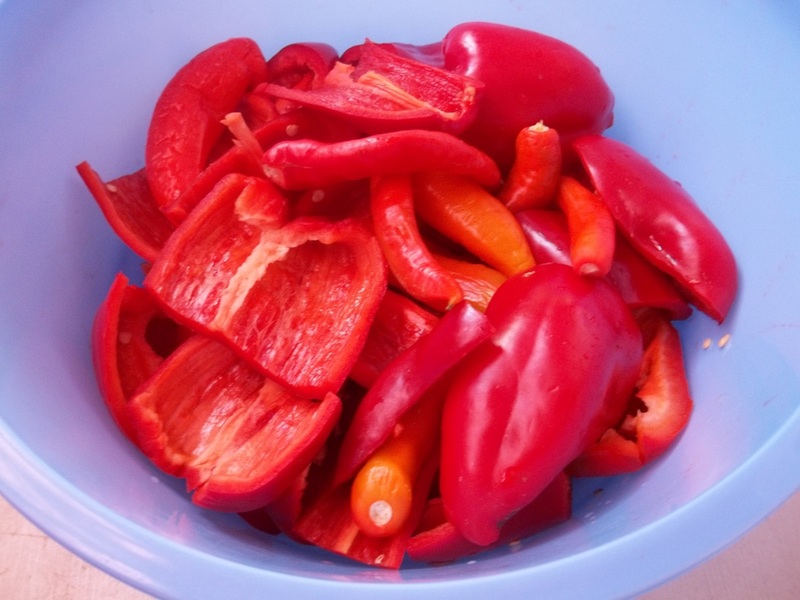 Slice the sweet peppers and remove and discard the seeds. 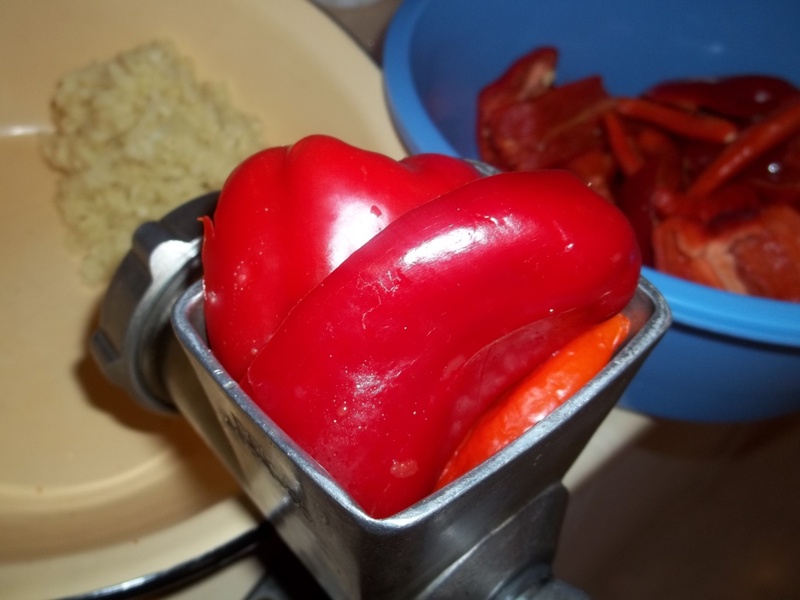 Crush the sliced sweet peppers and the whole hot peppers (we used a meat grinder). Add the crushed peppers to the bowl containing the crushed garlic. 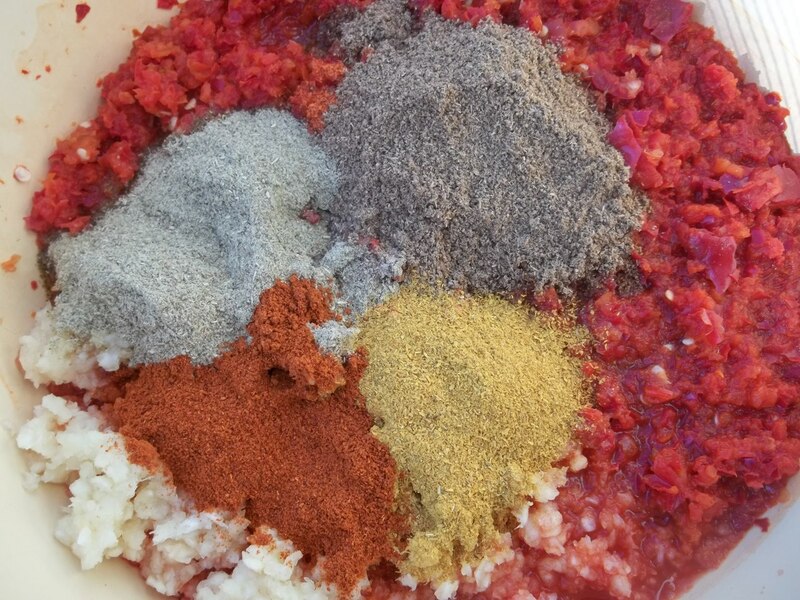 Add the ground black and red pepper (optional), blue fenugreek and coriander to the crushed peppers and garlic. 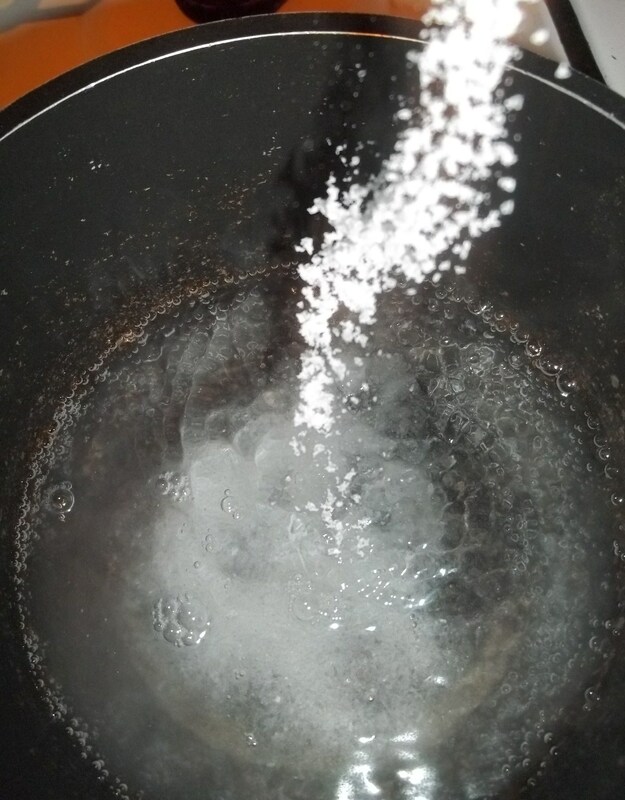 Add 200 ml of white wine vinegar to a pot, bring to the boil and add salt. 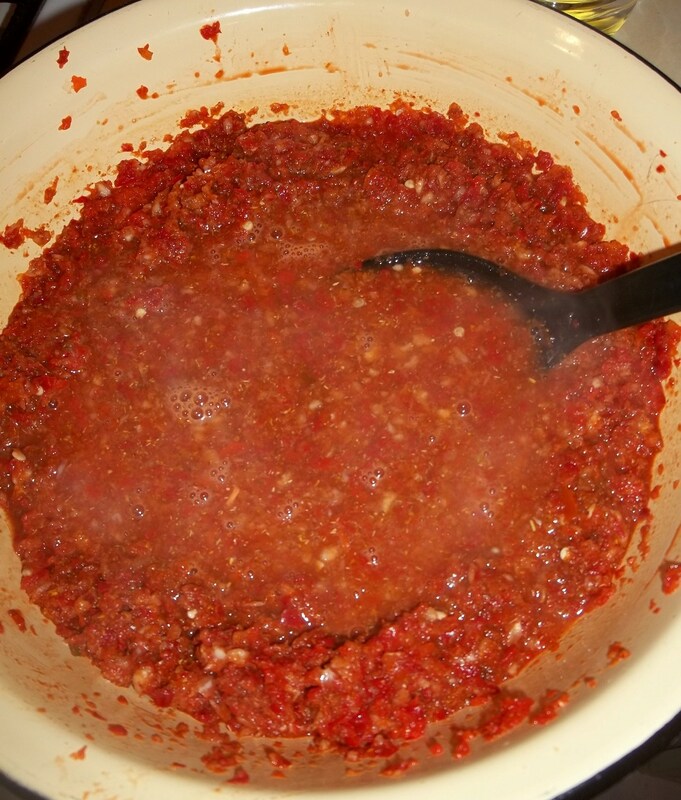 Gradually pour the hot vinegar onto the crushed peppers/garlic/spice mixture and mix thoroughly. Allow the mixture to cool for 5 minutes and then pour onto the fried eggplant. Stir carefully to avoid mashing the eggplant. 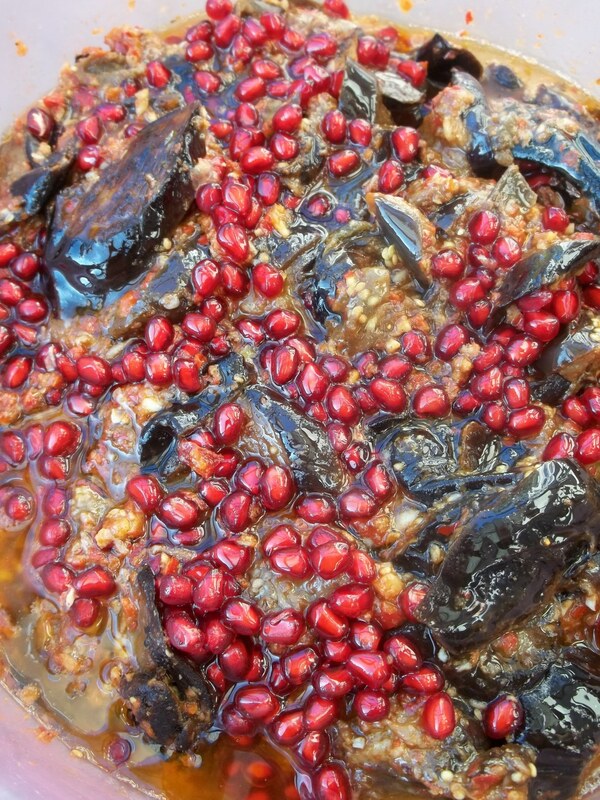 Remove the seeds from the pomegranates and add them to the bowl. Stir carefully. 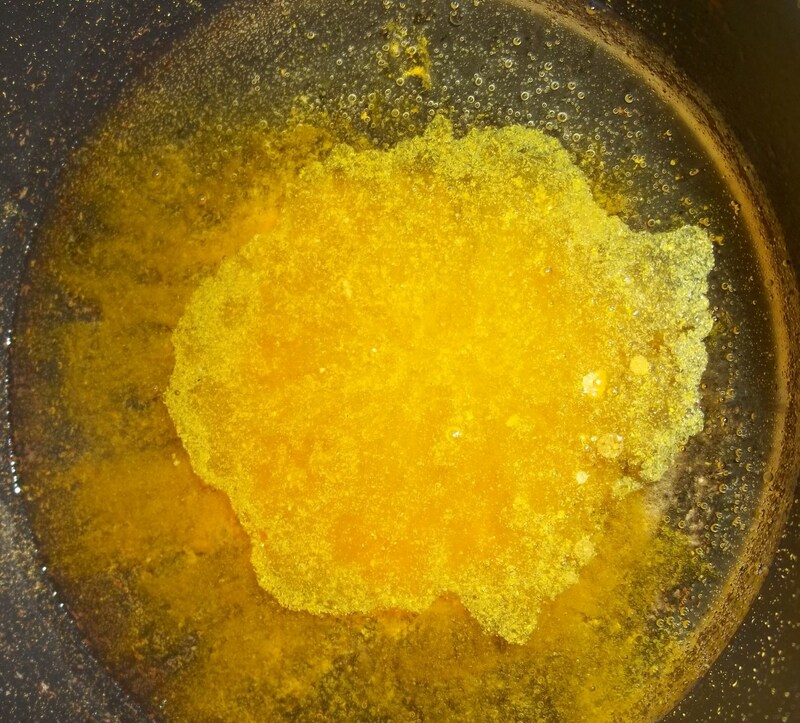 Add 200 ml of oil to a pot, together with the dried marigold, stir and bring to the boil. Slowly pour the marigold/oil mixture onto the fried eggplant mixture. Stir carefully and allow to cool. Serving: Leave for 3-4 hours before serving. 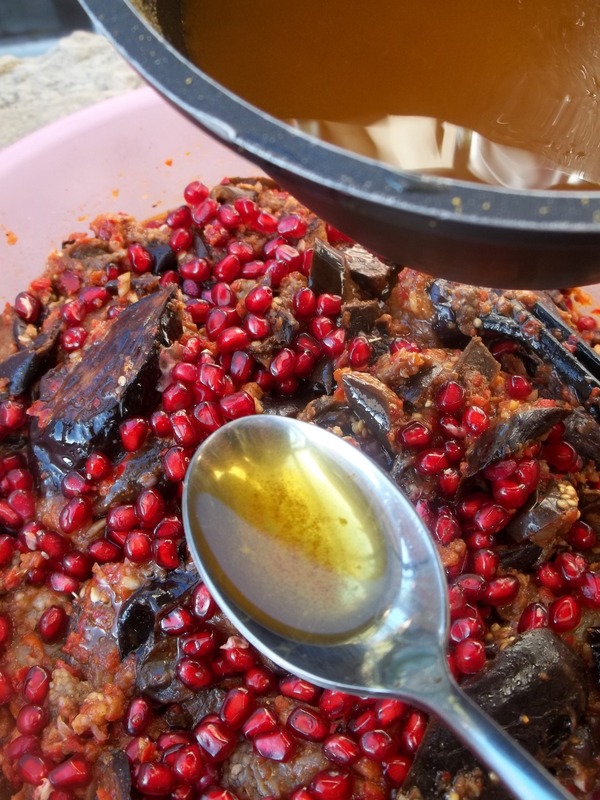 The marinated eggplant with pomegranate can be stored in airtight glass jars and will last for several months in a refrigerator or in a cool, dark place. 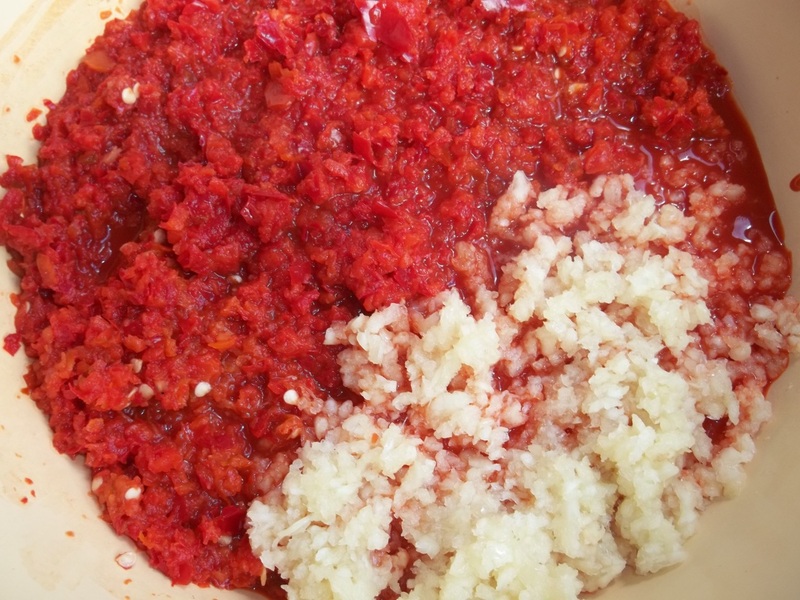 Before sealing, each jar should be topped up with the oil remaining in the mixing bowl. 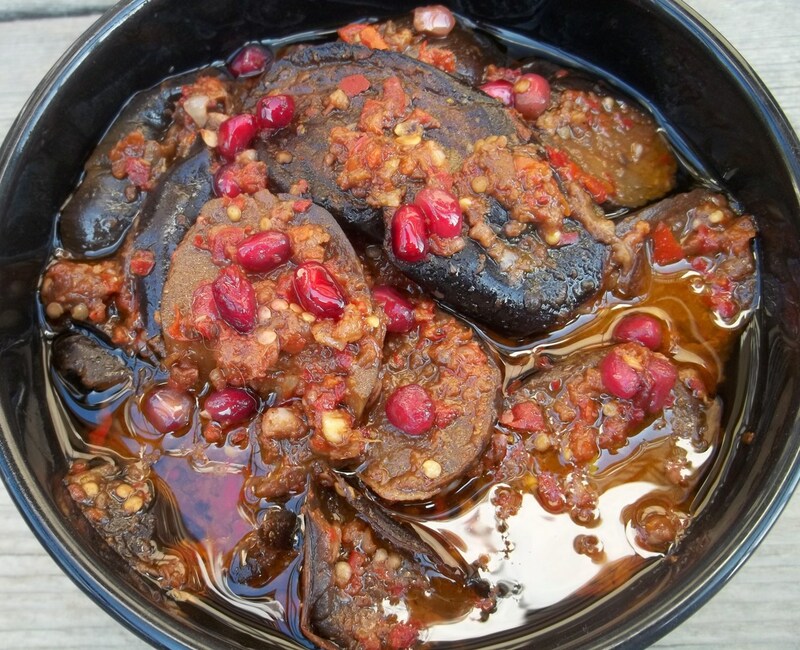 Enjoy your Marinated Eggplant with Pomegranate! weblog and am on the lookout for a theme as nice as this one. Its funny I should find this recipe, I grow all kinds of peppers every year and the only things I grow other than peppers are eggplants and tomatoes. I cant wait to give this one a try.